If you compare Gundam X to other Gundam series it isnâ€™t really that good. Also it hasnâ€™t a really big main story which is strongly followed throughout the series. Instead it is divided into several story arcs which are all connected to Jamilâ€™s journey to find and help Newtypes. 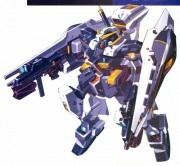 Also you often find connections to Gundam Wing like with the Gundams or the characters but nevertheless they all are unique and interresting. Also you will find connections to the Universal Century timeline. So reminds the space war and the colony drop at the beginning on the One Year War from the original Gundam series. Also the most remarkable part of the series is the story of the Newtypes and the most important part of it is the fact that it brings an answer to what Newtypes really are. No feedback on Mobile Suit Gundam: Alternate Universe.